Summer reading programs began in the 1890s as a way to encourage school children, particularly those in urban areas and not needed for farm work, to read during their summer vacation, use the library and develop the habit of reading. We have collected resources on summer reading programs across the country. This position paper is meant to help guide libraries as they re-envision the services and programs they provide youth during the summer months. The Collaborative Summer Library Program (CSLP) is a consortium of states working together to provide high-quality summer reading program materials for children, teens, and adults at the lowest cost possible for their public libraries. This free webinar is designed to teach participants how to administer Project Outcome surveys to measure outcomes for their library’s summer reading program. By successfully administering surveys, libraries are able to use the results to showcase program successes and influence future summer reading programs. Resources and articles provide information about summer reading and summer learning loss. Plus discover great activities to encourage kids to learn, read, and have fun in the summer sun. Check out RIF’s fun-filled booklists, activities, tips and resources to keep kids reading and learning throughout the summer and all year long. Learn tips for weaving language and literacy activities into your child’s summer days and for helping your school-aged child tackle her school summer reading list. Libraries are natural spaces for serving meals to children whose access to lunch disappears when school ends and summer begins. In an effort to prevent regression, encourage summer reading by providing literacy-rich activities to keep students motivated. Using online resources is one way to keep literacy activities fresh this summer. An article from Library Journal about ways schools and public libraries can team up to benefit children. While there is a plethora of literature pertaining to Summer Reading Programs (SRPs), there is little literature that focuses on the evaluation of these programs. What literature there is can be conveniently divided into two broad categories: summer school programs and public library SRPs. meaningfully through reflective discussion of texts. The summer reading Resource Guide includes ideas contributed by librarians from all over the world. 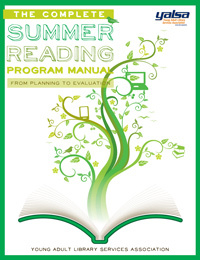 Summer reading programs are a mainstay of public library services; whether you’re embarking on your first SRP or you think you could plan one in your sleep, you’re sure to find helpful ideas in this complete manual from the experts at YALSA. You will learn how to set goals and objectives; establish themes and schedules; coordinate statewide and regional efforts; market and promote events; and evaluate program success. What teen wouldn't be interested in a poetry slam, hosting a cable TV show, or learning to be a DJ? This title provides 25 teen programs from public libraries based on the Search Institute's 40 Developmental Assets for Teens. The companion CD-ROM provides the sign-up forms, promotional posters, evaluation worksheets, permission slips, and more. A collaboration between the Chicago Public Library and the Museum of Science and Industry resulted in A STEAM-inspired approach, using evidence-based research to build the case for the change. This guide to planning a summer reading programme offers a brief background on running games, clear instructions and ready-to-use graphics. Books selected for children ages birth through Grade 5. This list can be a springboard for helping your kids choose books on topics that pique their curiosity — that's what really motivates children to want to read! A collection of book lists drawn from the American Library Association's award winning books, book lists, and resources. Links to YALSA's book awards, book lists, and Teens' Top Ten.